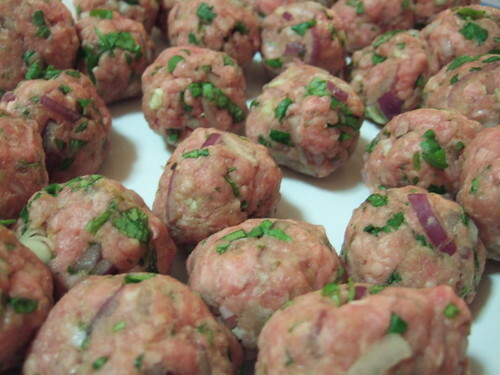 This is my basic recipe for making meatballs at home using either ground pork, beef or lamb. Depending on the dish I am using the meatballs for, I add breadcrumbs and an egg to make sure they remain intact when added. For more tagine and stew dishes, I skip both, substitute the nutmeg for cumin and usually add some mint. 1. Combine and mix all the ingredients in a large bowl. Form golf-sized balls with your hands using some breadcrumbs to help them stick together. 2. Arrange on a baking sheet and freeze for an hour. Once frozen, transfer to a re-sealable bag.